Who do you think you could trust to pull-off a live show with unstoppable energy and juggle an eclectic and explosive mix of hard rock, electronic rock, alternative metal, nu metal, rap rock and rap metal all rolled into one? Only one band comes to mind — PAPA ROACH! With a chart-topping streak that dates back to the '90s, Papa Roach is a mean killing machine with ammunition of hits songs that could trigger one big explosive mosh pit. 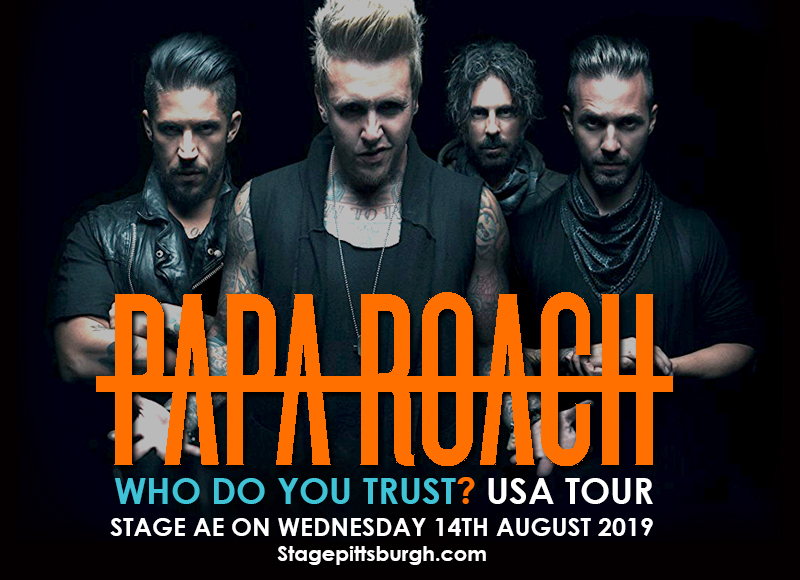 Come in full rock metal gear at the Stage AE on Wednesday 14th August 2019. Be part of their "Who Do You Trust?" tour. This is a rock movement of a lifetime that you should not dare miss. Book your tickets now! Papa Roach is synonymous to a hybrid of metal rock and rap. They made this an indelible signature sound that has kept fans rocking since 1993. Schoolboys Jacoby Shaddix and Dave Buckner found themselves in a football field discussing the potential success they were going to achieve if they formed a band. Soon afterward, Will James and Jerry Horton joined in and started the building blocks of what is now considered as the tower of power of rock and rap metal — Papa Roach. In 1994, Papa Roach released their oddly-titled debut EP, "Potatoes for Christmas", in between juggling school work, jobs. and local gigs. Their growing set of followers slowly but surely positioned them as one of the fast-rising bands of that decade. It also gave them a major label signing where they released their official debut album "Infest". It gave them a strong and steady stream of successes as it spawned the hits "Last Resort," "Infest," and "Broken Home." They started basking in mainstream success as more chart-topping hits and sold-out shows rolled-in. They embarked on tours that brought them together with other rock and rap heavyweights like Ludacris, Eminem, and Limp Bizkit; and they conquered bigger stages and festivals like the Ozzfest. Just in the neck of the woods is a Papa Roach live show coming at you. Lock-in those tickets now!